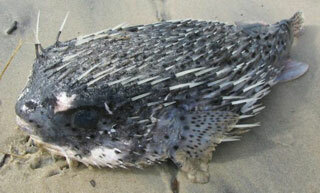 "Spiny; spiny creatures, especially the puffer fish, Diodon hystrix". PROTO CENTRAL EASTERN POLYNESIAN, in part from PROTO OCEANIC *tara "barb, prong", through PROTO EASTERN FIJIAN / POLYNESIAN *cala "sharp pointed object; sea urchin" and PROTO POLYNESIAN *tala "sharp pointed object, spine, prong". If you think that the picture on the right doesn't ;look like a plant, you are correct -- it isn't. Rather it is the puffer fish, Diodon hystrix, which is the creature denoted by reflexes of *tötara in many Polynesian languages. 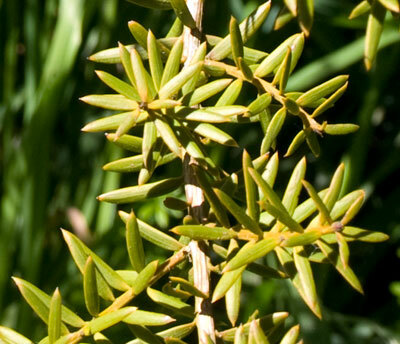 But if you look at the spines, you'll see why in Aotearoa the name was applied to the tötara tree, Podicarpus totara, whose prickly mature leaves, pictured below, are highly reminiscent of the tropical tötara's spines. The other Mäori reflexes of *tötara also refer to plants with stiff, prickly leaves. 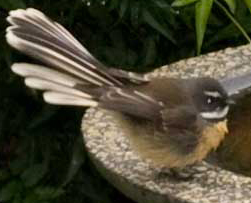 Robert Blust (Austronesian Languages, p.324) has noted that this kind of change in meaning motivated by a change of physical environment is well illustrated by the reflexes of the Proto Malayo-Polynesian word for porcupine fish, *taRutung, which in communities which had retained their links with the sea, from the Philippines to Polynesia usually has retained its original meaning unchanged, has been used in inland communities to refer to prickly land animals like porcupines or prickly fruits like the durian. Related Words. There are several other plant names associated directly or indirectly with marine creatures. A Hawaiian parallel to the Mäori deployment of the fish-name tötara to designate a tree is the use of häpu'u, from Proto Polynesian *fäpuku, reflexes of which generally denote one or more species of grouper, to designate highly valued species of tree ferns of the genus Cibotium; in Mäori, Te Häpuku is the deity associated with marine mammals and tree ferns, and in both languages the cognate word also denotes the fish species.